Cypress Bayou Casino Hotel is proud to announce that a lucky guest from Lafayette, LA has won a jackpot in the amount of $343,679 on a wide-area progressive dollar Wheel of Fortune Triple Red Hot 7’s slot machine. 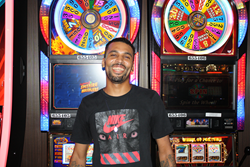 Lensly J., from Lafayette, LA, poses in front of his favorite slot machine, IGT's Wheel of Fortune Triple Red Hot 7's. Wheel of Fortune progressive slots are some of our most popular machines and continue to be a draw for our players from throughout Acadiana. Cypress Bayou Casino Hotel is proud to announce that as lucky guest from Lafayette, LA has won a jackpot in the amount of $343,679 on a wide-area progressive dollar Wheel of Fortune® Triple Red Hot 7’s slot machine. The win was verified. Cypress Bayou Casino Hotel is located in Charenton, Louisiana off US Highway 90 and features over 1,000 slots and more than 30 tables including Blackjack, Mini-Baccarat, Mississippi Stud, and 3-Card Poker just to name few. Enjoy dining at any of the five unique venues and stay in the modern 102-room hotel. Call 1-800-234-4386 or visit http://www.cypressbayou.com for more information.